China’s economy is losing momentum, the financial press warns. “Waking up to the systemic threat posed by cheap credit-fueled stimulus since the 2008-9 global financial crisis, Beijing has continued to tighten the screws on speculative financing over the past several months,” Reuters reports. Meanwhile, the Shanghai Stock Exchange is stalling out. Just one month ago, The Shanghai was up more than 5% year-to-date. Now it’s dropped into the red on the year. Mainland China hasn’t exactly set the world on fire since a quick boom-bust cycle gripped its markets a couple years ago. The Shanghai Composite found itself in a flat-out crash in June 2015, officially putting an end to a 12-month buying spree. While Chinese shares tanked, analysts predicted the worst was yet to come. Well-known Chinese stocks that trade on U.S. exchanges started falling off a cliff. Investors wanted out at any price. But the dreaded China slowdown didn’t obliterate world markets. It also didn’t crater the Chinese stocks listed on American exchanges. In fact, these Chinese shares quickly reversed and began posting powerful breakouts. If you’re quick enough, you can even grab onto these resurgent stocks for a quick trade before most investors figure out what’s going on. Then there’s Alibaba (NYSE:BABA). 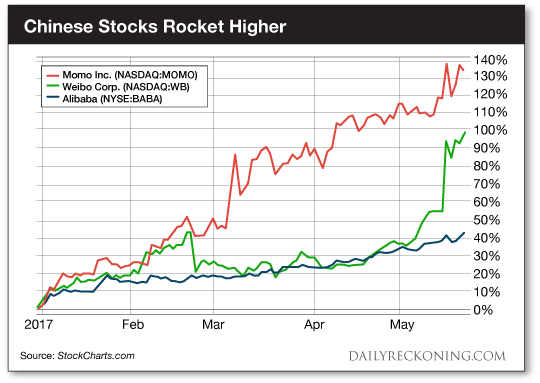 You might remember when Barron’s declared BABA shares were about to get cut in half back in 2015. This article hit newsstands just after the Chinese online retail giant’s shares had already endured a sharp drop of more than 40% from their November 2014 highs. Barron’s took a chainsaw to Alibaba’s growth projections, forcing the company to respond publically to defend its business model. As the panic reaches fever pitch and there was no one left to sell, we started to see the initial bounce off the lows. Alibaba stock posted its lows right as the third quarter ended. No fund manager wanted to be chained to this stock heading into the end of the year. That’s when the first signs of a true comeback materialized. Finally, Weibo Corp. (NASDAQ:WB), which Bloomberg describes as the most popular of China’s Twitter-like microblogging platforms (Twitter and Facebook are both banned in China) has jumped almost 100% since January 1st. The company just crushed its most recent earnings report and upped guidance for the year. There’s no question that these Chinese tech stocks are attracting new buyers this year. It’s the perfect place to look for your next hot momentum trade. The post The Strongest Stocks on the Market Are… appeared first on Daily Reckoning.